Obama and Hillary built this, but what difference does it make? Twenty-six people were killed and 277 injured in escalating clashes in Egypt today. 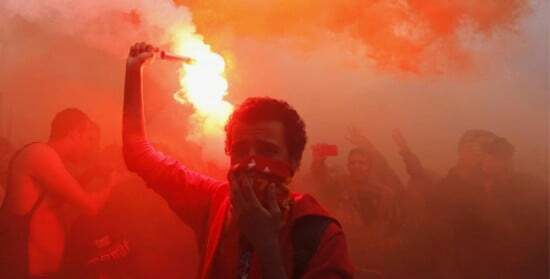 Two Port Said football players were killed during the escalating clashes in the city, bringing the death toll to 24 following a court ruling that sent 21 people to the gallows for their role in one of the world’s deadliest incidents in football violence. Tamer al-Fahla, former goalkeeper of the al-Masry team, and Mohammad al-Dadhwi who played for Port Said’s al-Mareekh team, were both killed after the sentence pertaining to the “Port Said Massacre” was issued. Both bodies were transferred to the hospital’s morgue in the city. The board of directors at al-Mareekh’s team did not comment on the sentence, but it held the political leadership responsible for what happened. The al-Mareekh’s board announced mourning at al-Dahawi, who was going to be transferred into another football team in the Egyptian league, but the deal did not go through. The judge, Sobhy Abdel Maguid, read out a list of 21 names “referred to the Mufti,” a phrase used to denote a death verdict as all such sentences must be reviewed by Egypt’s top religious authority. However, according to AFP, the death toll in Port Said has reached to 26 people killed. “Twenty six people were killed and 277 injured,” said Adbelrahman Farag, the head of Port Said hospitals.